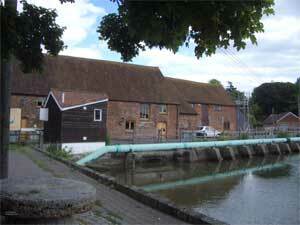 Eling Tide Mill is a water mill that harnesses the power of the tide to grind wheat into wholemeal flour. Situated on the edge of Southampton Water beside the renowned New Forest, there has been a mill on the site for over 900 years, although it has had to be rebuilt several times, with the current building being some 230 years old. Eling Tide Mill, although abandoned in the 1940s, had the great good fortune to survive until it was restored between 1975 and 1980, at which time it re-opened as both a working mill, and a museum to this part of our industrial heritage. It is the only fully working and productive tide mill in the United Kingdom, once again producing flour as it had throughout the last Millennium. It is, in fact, one of only two productive tide mills in the entire world (to the best of our knowledge), and the only one producing what it was built to produce. The mill originally had two waterwheels, each driving two sets of millstones. We have restored one wheel with one set of millstones and left the other side unrestored so that people can see the machinery without modern safety screens around it. We run the working machinery each day when the tide is right and produce and sell flour to visitors and local customers. A partnership of New Forest District Council (NFDC) and Totton and Eling Town Council has invested in the future after securing a grant from the Heritage Lottery Fund, which included work on all four parts of The Eling Tide Mill Experience. This included essential conservation works of the mill, extending and developing the visitor centre to create a new learning centre and caf�, and improving access to outdoor areas of Goatee Beach and Bartley Water. Visitors can now see the power of the tide turning the wheel and millstones. There is an interactive exhibition of its history, walks along the Eling Creek shoreline and a brand new Mill Cafe. 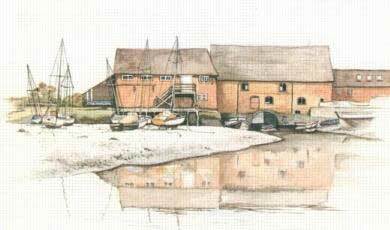 Eling Tide Mill is on the southern edge of the town of Totton & Eling, on the west side of the northern end of Southampton Water on the South Coast of Great Britain; it is approximately two miles west of Southampton in the county of Hampshire, just outside the New Forest. The information on this page is from the web site.